Anyway, I'd like to share a bit of news with you from the Newsletter. There is a fabulous new website called Magpie Patterns. Magpie Patterns offers a lovely selection of craft books and craft patterns for sewing, crochet, knitting and embroidery. I'm happy to say that most of my embroidery patterns are available through Magpie Patterns now. But of course you can still buy them at ye olde Follow the White Bunny Shoppe on Etsy! P.S. Thanks for all your congratulations on our wedding anniversary! Love the details of the fur and bark in your drawing. Bah humbug about gmail blocking your outgoing mail :(. Hope that gets resolved soon. Bad Gmail! 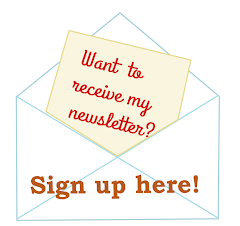 I hope it behaves soon, I would love to see your newsletter. 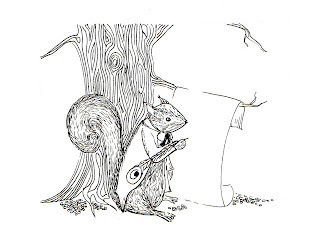 Mr.Squirrel is quite charming. Thank you for the link to Magpie, I am off to explore. Yes Mr. Squirrel is a real gentleman! I'm thinking of sending him off to Amy Karol as a Thank You for the book I received.